Runner’s knee (patellofemoral pain syndrome) is pain at the front of knee and around the kneecap (patella). There are many structures that control how the kneecap moves in the groove of the thighbone (femur). Imbalances in these structures can contribute to pain, abnormal tracking of the patella, and sometimes wear and tear on the underside of the kneecap (chondromalacia). Activities that require repetitive bending of the knee may make the kneecap pain worse. What are the symptoms of runner’s knee? How is runner’s knee diagnosed? A discussion of your symptoms, a physical examination, and X-rays are useful for a diagnosis. Your specialist may recommend having an MRI scan as well. How is runner’s knee treated? Surgery may be needed in severe cases of runner’s knee. A surgeon can remove damaged cartilage or correct the position of the kneecap so that stress will be distributed evenly. What can I do to prevent runner’s knee? Ask Sam Olson: Does My Running Shoe Matter? 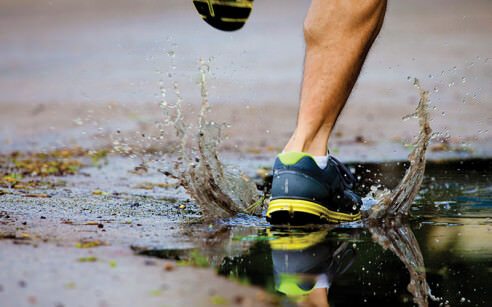 Choosing the right running shoe starts with an understanding of the relationship between our feet and our bodies. Summit physical therapist Sam Olson explains how our feet inform our body, and discusses the latest research about running shoes. A contestant at the annual October Twin Cities Marathon described the start of this year’s race over the misty Mississippi as “running into heaven.” There’s no reason why a long run on a crisp autumn day can’t always be a heavenly experience. By building… Read More. Get top tips from the experts on preventing running injuries in our Running QUICKGuide.